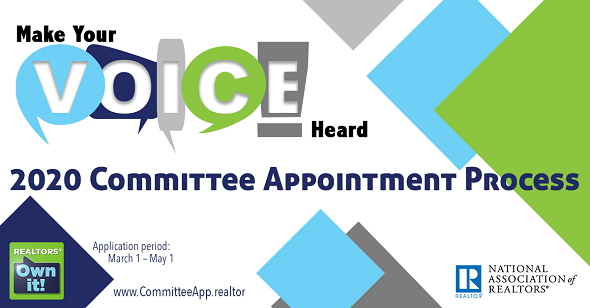 The National Association of REALTORS® is now accepting applications for volunteers to serve on 2020 committees. This is a unique opportunity to have a direct impact across the country and we invite you to apply for a committee that you are interested in and passionate about serving. The 2020 committee application website is now open through May 1. Here is the information you will need to apply today. Current committee members whose term expires in 2019 must submit an application to be considered for service in 2020. Please note that there is a policy in place that members will only receive one appointment. Read more about the application process here. Questions? Contact Victoria Holmen, NAR Committee Programs Coordinator | Member Experience, at vholmen@realtors.org.